There will be no baby eagles growing up this year on the Pa. Game Commission's world-famous eagle cam, experts say. There will be no baby eagles gorging on food, shedding their down and growing up this year on the Pennsylvania Game Commission's world-famous eagle cam, experts say. The second egg in the Hanover-area nest just outside Codorus State Park had failed to hatch as of Monday, and therefore isn't expected to hatch at all. "In nature, every single thing is a struggle," said York County birding expert Karen Lippy. "It is a lesson in life. Not everything goes perfectly." There is no way the egg could be viable at this point, she said. "It's been exposed so many times to heat and cold," Lippy said. "(Eagle) eggs must stay a constant 99-degree temperature." 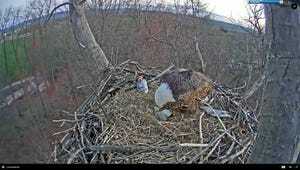 And the parent eagles have begun losing interest in the egg. "You can see that every day, they leave it alone more and more," she said. Last week, a 2-day-old eaglet in the nest died after hatching March 28. Viewers who closely watch goings-on at the bald eagle nest and post musings on Facebook took comfort in the fact that at least one egg remained. That left the possibility the mated eagles could successfully raise at least one chick this season. But on Monday morning, the game commission noted on its Facebook page it's unlikely the egg is viable and that it's unknown what caused this year's nesting failure. Nature's way: Like the game commission, Lippy also stressed that no one knows for sure why the eaglet died and why the other egg never hatched. However, she has her suspicions. About two weeks ago, something chased the female eagle from the nest when it was just 29 degrees outside, and the egg was exposed to cold air for more than a half-hour, she said. "She had been chased off the nest four times," Lippy said. One viewer reported seeing talons coming down and striking the female on the back of her head, Lippy confirmed, adding that such an attack would most certainly have come from a great horned owl. "Last year they (a great horned owl family) nested less than a quarter-mile from the eagle nest," she said, noting the large owls vie with eagles. "They're just doing what comes naturally to them. There are no good guys or bad guys here." Some avid eagle-cam watchers have theorized a stick that fell on the nest might have crushed the chick, but Lippy said she doesn't believe that was an issue. She also believes the parents are far too experienced to have smothered the chick, as some online viewers have posited. Hatching issue: Lippy said she is more focused on the fact that this season's eaglet took nearly 24 hours to hatch, which she suspects weakened the chick. "The longer that chick struggled, the more concerned I was," she said. "The parents fed it four times and it seemed to be getting stronger and thriving. It was calling (for food). Then it just laid down (and died)." It would be foolhardy to expect every eagle nest to be successful every year, Lippy said. "This is nature's way of controlling population," she said. "We may not like it, but it's essential that populations be kept in balance. ... I look at the long picture. They've been here 13 years now and in that 13 years they've fledged 16 chicks. That's an above-average record." A year off: The mated pair will be able to use this season to increase their own strength instead of raising offspring, Lippy said, meaning they hopefully will return to the nest next season even stronger and ready to start again. In the meantime, local birders can come to Codorus State Park and watch two pairs of ospreys. One pair is adding sticks to an osprey nesting platform, while the second pair is showing interest in a platform erected on private property next to the park, Lippy said. "Osprey are still considered threatened in this state, so having two pair here is exciting," she said. People can watch live-streaming nest cams for all kinds of birds on the Internet, Lippy said. If you select "All About Birds" on the Cornell Lab of Ornithology's home page, then select "Bird Cams," the website offers a number of nest-cam and feeder-cam choices to view raptors and songbirds, including a great horned owl nest cam in Savannah, Georgia, that currently has two owlets. Last year's chicks: Nearly 1.5 million individual viewers from around the world tuned in to the Hanover-area eagle cam last year and watched, occasionally with trepidation, as two eggs hatched into defenseless pink chicks that quickly grew into ravenous, demanding fluff balls. By mid-May 2015, there were 23.8 million live-stream views of the nest, according to Travis Lau, press secretary for the state game commission. The eagles have nested in the area since 2004, Lippy said.